But this week I was privileged to view such a video of southwest U.S. thunderstorms that was created by Mike Olbinski. 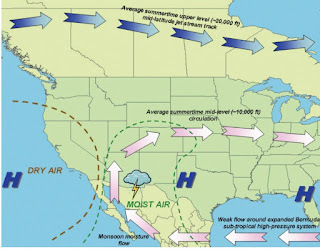 The Southwest (or North American) monsoon is associated with often spectacular thunderstorms over Arizona and the interior US Southwest during summer (roughly late June to August). 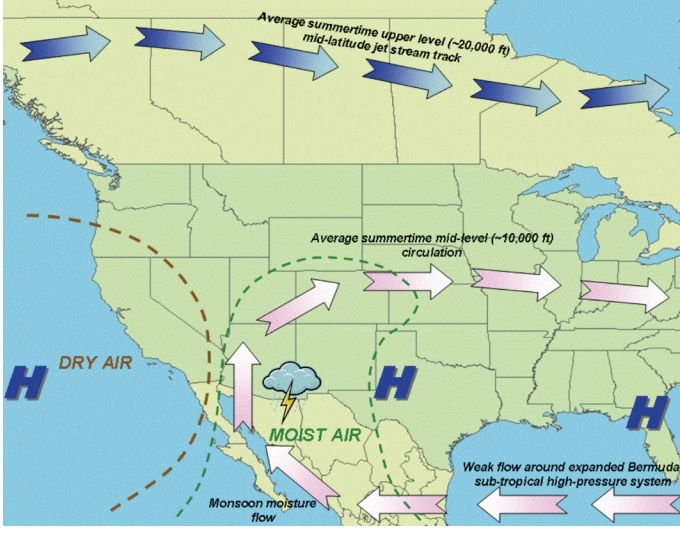 The large scale circulation pattern that produces the monsoon has high pressure over the Gulf of Mexico and moist southerly flow moving northward out of western Mexico (see graphic below produced by the Arizona cooperative extension). Monsoon thunderstorms are not only vigorous, often with intense and substantial rainfall, but tend to be high based, allowing a good view of rain shafts and dust storms below the main cumulonimbus cloud. Yes, dust storms. Strong outflow winds can be produced by descending air from the thunderstorm that hits the surface and spreads out (see figure). The air accelerates downward due to the downward drag of the falling precipitation and the evaporative cooling of precipitation in the dry air below. Cool air is more dense, resulting in downward acceleration. These winds can raise sand and dust, creating dust storms that are often called haboobs. 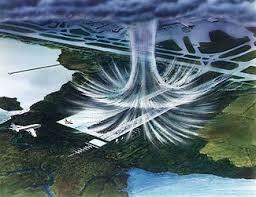 The strong winds moving out of thunderstorms can also be very dangerous for landing and departing aircraft. OK, back to the video. In it will see many examples of precipitation falling out of thunderstorms, lots of lightning, and stunning dust storms. Click on the link below, and be prepared to be moved. Mike Olbinski is a poet videographer. Monsoon V (4K) from Mike Olbinski on Vimeo. And if you like this one, there are four earlier Monsoon video and a wonderful one called vorticity. Absolutely gorgeous! Thank you for sharing the monsoon video, mother nature is truly awe inspiring. He's good but he's going strictly for visuals. I kept wishing he would just hold a while on a single cell and let it evolve. Those LP Supercells are stunning fer shure. Absolutely stunning-both the photography and the music, which beautifully complemented the video--Bravo! Awe inspiring to say the least. A beautiful collage of many separate events. (For teaching purposes - I'm still learning - I'd like to see single events in slower motion, over the duration of a local occurrence.) Thanks so much for sharing. Very impressive. I've been watching Mirimar videos like this for decades, with Tangerine Dream sountracks - check out "Oasis" and "Canyon Dreams" if they are still out there. Modern cameras have made this easier and more Hi Def, but it's definitely not a new thing. Here's wishing we had more weather like that up here! It's one reason I like to visit southern Colorado in summertime. When I go there for peak bagging, there's always some excitement. I might add that down in New Mexico, if I am not mistaken, the peak forest fire risk is actually pre-monsoon, in May. Later, despite the lightning, there is enough rain that the wildfire risk drops. Spring is their dry season. I got to meet Mike Oblinski out storm chasing in Kansas last year.Vorticity is his best video in my opinion. Im trying to learn to timelapse the weather in WA state and out in tornado alley half as well as Mike Oblinski does it. Great work. These are stunning, awesome. But there are rare, stunning events here also. Last year, for example, on May 4 2017 there was a thunderstorm that lasted about an hour here near Mt Baker that probably rivaled some of those scenes. There was wild wind, the downpour hammered the ground, and the accompanying lightning and thunder pealed through the hills so constantly that I grabbed my audio recorder to capture some of the excitement. I'd happily share those MP4's with anyone. The squall wasn't a record-setter (.75" in about an hour). But we have had deluge days, like 3.45" last Oct 9, and in the last two weeks 10/28 we had 2.03" and 11/2 2.49". It's a shame that the landscape doesn't provide many good vistas for capturing the thrills and chills. I'd love to see timelapse footage of what we do get. Stunning video Cliff. Thanks for the share.